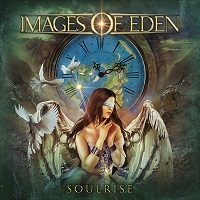 With a very heavenly and graceful name and album artwork, IMAGES OF EDEN parades their 2018 album “Soulrise”, a 12-track full length record. Their genre for me is progressive power metal. Their sound is largely akin to Pagan’s Mind. Opening song “Harvest Day” begins with a huge buildup of guitars and drums, straight to a very intense and heavy atmosphere. The singing is spectacular all throughout, and all the instruments blend together so well making a perfect harmony. Intensity, power, melody and aggression are what they paraded in the track “Shield Me”. The tune and the mood of the song is heavy and aggressive right from the get go. The singing is what applied the touch of power and emotion in the song, with its high notes and edginess. The solo is so complex, it sounds like a combo of power metal, thrash metal and classic heavy metal. The songs in every element are complex. The shifts in the vocals, the changes in the tempo and the drum patterns are of Dream Theater level. One thing that makes it more interesting is that while they are largely progressive-power metal, there are also some certain elements of thrash present especially in the songs like “Only Human”, “Godless” and “Twice Upon a Time”. While every song here seems to be all about power and aggression, they go mellow with “Moonrise” and “Once We Believed”, a couple of power ballads. Let’s face it, power ballads are the weaknesses of every power metal fan. It’s one of those times when the bands decide that they don’t need to go on the speed of light, hence creating songs that possess celestial beauties in the highest order. These tracks have a lot of keyboard presence and sharp guitar solos. There is no better word to describe the songs but heavenly beautiful. These power ballads dominate the latter half of the album, therefore making a statement of the band’s overall versatility. The insertion of these power ballads is like how X-Japan did it. While most bands find it rather difficult to insert ballads in between high octane songs, they did it flawlessly without any issue. The last song in the album is the epic ten-minute title track. It’s like the compilation of every technique and style they displayed in the first eleven tracks, making it the best attraction in the album. If someone asks what IMAGES OF EDEN is about, this song will be my example. Overall, the album is certainly awesome. There is one power metal element missing though, it’s the catchiness – the one element that power metal is mostly known for.